Hunted and Stuffed opens virtual stall on MAKERHOOD Brixton – a local shop for local people! MAKERHOOD is an amazing new website which connects local makers in Brixton and environs in SW London with local buyers. It’s like an anti-Tesco conceived and made by volunteers. A Hyper-local Etsy where you can meet your buyer to hand deliver your product and maybe have a coffee too. In Beta, it’s growing day by day and creating new communities as it goes. Rolling out to your town soon? 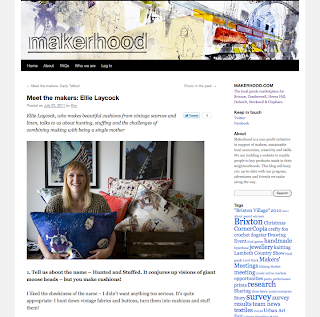 I was lucky enough to be selected for a “Meet The Makers” interview on the site so click here if you want to know a bit more about Hunted and Stuffed or where to find the friendliest coffee in Brixton.